In 1991 I was lucky enough to be at the first Manopticon convention inManchester. It boasted two Doctors in attendance, the author of this Blog’s favourite: Colin Baker, and my Doctor:Jon Pertwee. Whether Baker ever knew that Pertwee wickedly returned the favour the following day with an equally rapturously-received Troughton recollection from The Three Doctors is not on record. The point is: everybody loves Pat. Of all the ‘classic Doctors’, the Cosmic Hobo never seems to have endured the ‘cooling-off’ period which the others have; never had to suffer the slings and arrows of capricious fandom. And anyone who’s ever seen Troughton, in anything, can see why. Whether it’s opposite Christopher Lee in Scars of Dracula, or Gregory Peck in The Omen, is abundantly clear he could hold his own against the very best in the business. Opposite the likes of Frazer Hines and Wendy Padbury however, he didn’t just have to hold his own, but seemingly support entire last-minute and rewritten stories, brace hours of near-identical bases under siege and carry drab set-fulls of interchangeable characters. There, I’ve said it. I’m sorry: while I unhesitatingly agree that Patrick Troughton and the Second Doctor are a sublime creator and creation, but that doesn’t mean all his episodes were too; as hard as many might want to believe. The reputation of Troughton’s run seems ironically enhanced by the fact that so little remains. This scarcity of evidence has led many to smile fondly at the memory of masterpieces almost none have actually seen, even after the hard lessons not learned following the recovery of Tomb of the Cybermen. We often forget how close the end credits of the tenth instalment of The War Games came to being our last Who ever. I admit I’m shallow: the murky, stagey, shouty remains of the Sixties are never the first place I go when looking to watch some Who. And I also know the dangerous ground on which I walk, recalling well that fateful interview that Matthew Waterhouse gave DWM, when he committed the cardinal sin of giving his honest opinion about a certain Troughton-era companion. The vilification young Adric received in the following month’s letters page even caused DWM to distance itself from Mr Waterhouse’s personal views. Despite some assertions that Troughton is not entirely ‘in character’ throughout, The Three Doctors remains one of my favourite Second Doctor stories. Unhindered by his traditional monochrome baggage, he’s delightful: puckish, feisty and his irreverence and smoke-screen frivolity lend the story it’s funniest and most memorable moments. I love the Second Doctor as much as any of the others, possibly more so as he always tried to give my own favourite a hard time, and I still love him. But like any other incarnation, his stories are far from perfect, his companions far from flawless and his monsters some way from being universally convincing. The Second Doctor: not the Messiah, just played by a very, very good actor. Zeus Blog wishes to distance itself from the personal views of Mr Hughes. Sunday’s reported passing of classic series designer Ray Cusick offers yet another grim reminder that the success of the early series and its revival in the Twenty-first century owes much to the dedication and inspiration of a dwindling number of hard working men and women from as far as fifty years ago. Through to today while the story of Doctor Who’s own genesis is being committed to film, the likes of Ray Cusick have been a line connecting the early production plans for a fledgling children’s TV serial of little-known promise to today’s near-juggernaut of popular culture. Palpably, if one can attribute the success of Who in its first year to its most recognisable, imitable and recollectable invented image – the Dalek, and thereby attribute the successful return of the series in 2005 to the labours and loyalty of mature fans of the ‘classic’ series, then we can correctly say that the name Ray Cusick deserves to be held alongside those of Verity Lambert, Donald Wilson, Terry Nation and Sydney Newman as those Without Whom we would not be here as bloggers, viewers, creators and fans alike. But beyond that impressive and enduring dalek silhouette lies an equally impressive body of work. Cusick was not only the designer of the Daleks, but the visionary of their city and world, the petrified forest and steel-lined corridors that dominate the early serial. Beyond Skaro Cusick’s imprint is also on the Sense Sphere and Mechanus, each featuring vaulted, Gaudiesque architecture that give organic lines to an otherwise stainless and hard-edged futurism. For better or worse Cusick’s work is also throughout the six episode travelogue that is The Keys of Marinus – anyone who owns the DVD to that story will know how vocally disappointed the designer was with his efforts there, but I can only admire the resourcefulness of a man who, faced with six location changes over the same number of episodes, a very tight budget and the usual turnaround expectations actually delivers. Moreover, there are clear examples in the series where it is Cusick’s eye for detail and design that save an otherwise unremarkable story – the enormous props for Planet of the Giants, for one. And before we connect Cusick with alien worlds fully, it bears noting that the early extra rooms in the TARDIS (The Edge of Destruction) were also the result of Cusick’s designs. It’s a great shame that in their own fiftieth anniversary in December the designer of the Daleks will not be present to share the accolades and celebration. Much has and wil be made on how or whether Cusick was short-shrifted by Terry Nation over due recognition and reward for the blueprint of a million childhood toys spanning half a century; but within fandom there can be no doubt. Raymond Cusick’s work on Who alone ensured the series’ popular appeal and created a striking visual stamp that is as much of its own era and country as the Mini Cooper, the Beatles mop-top and the Op Art of Bridget Riley, and which continues to be admired and cherished today. An enduring design speaks for itself, and that of the Daleks will forever speak of their undisputed visionary engineer. Here’s the thing: I used to – even until quite recently I’ll admit, believe that a deep and enduring interest in Sixties Who was the last refuge of the ageing fan. When all fascination for the action and wit of the Seventies, the flash and sting of the Eighties and the promise of the Nineties had dried up, the retiring and increasingly embittered Who enthusiast would at last turn his or her dried and cynical self away from the recent past and find solace in the fuzzy monotone folds of the Hartnell and Troughton years, there to shuffle themselves to an endless sleep or, worse, bitterly reject the innovations of later Who – that of my generation and those immediately following, as cheap and flimsy, lacking the weight and interest of the Early Years. My suspicions were deepest when fans younger than myself started the same drift – easy enough to explain in older followers, I thought, who might have genuine memories of the black and white show as televised on various local stations or even in the Mother Country, but younger fans? Surely this was just an attempt to be cool and rebellious? A wilful spurning of the values and energy we’d enjoyed as teens and later? I can’t speak for those fans, but I can speak for myself. In the past two years I’ve become a Sixties Who lover. Of course I’ve got older, having crossed the boundaries of middle age. I love the Seventies and Eighties no less, I hasten to add; but I now love the Sixties more than I ever did. To me they are indeed broader, deeper, and more intriguing. They are the innovative years, and their Doctors are fascinating and alien, their companions all the more human for the contrast. Sixties stories with their reduced score and longer episodes are drawn out, contemplative, with nervous pauses and great moments of silence. They are of an era of stage, both in location and performance – their performers (Hartnell in particular) are more clearly cut from the stage and occupy the studio floorspace with an eye to an intimate audience. There’s little that’s post-production here; the special effects are either practical or in-camera, the spaceships are models and the monsters makeup and costume. It is low-tech, but I really don’t mind that. It was known to be low-tech in its own time; its success was due to its imagination, as it has ever been. And what imagination! The idea of space and time in the Hartnell era is markedly different – the Doctor and Susan refer to themselves as outsiders, travellers, and (because of course the term hadn’t been invented yet) there is no mention of either of them being masters or Lords of Time. They don’t even have control over their Ship – pointedly so in The Edge of Destruction where the machine (for it is in this era) turns on them in a strange attempt to warn them of a more imminent and external danger. The threat from outside is a recurring motif – the alien, the distant world with an unnatural ecosystem, the altogether unfamiliar. The Universe is an immediately unfamiliar and sometimes hostile place, something for all companions to first explore, then negotiate with week after week, before finally finding their place in it – there’s no overfamiliarity with the cosmos or knowing meta-commentary of the new series companions here; the likes of Ian and Barbara, Vicki and Steven are themselves interlopers, small figures on an enormous and threatening landscape. There’s little cosiness here at all, I find – no recurring old friends to reconnect with or rely on for comfort, and there’s every reason to believe that when the Doctor promises Susan he’ll return to her at the end of The Dalek Invasion of Earth, he really won’t. And then there’s history, an extra dimension to be explored and negotiated, where the series’ early lessons of interference and free will are exercised (The Aztecs) and the Doctor’s morality – perhaps then a reflection of his own helplessness to turn the wheel of time, is brought to the fore (The Massacre.) To accompany a mad man in his time travelling box may be one thing, but to be effectively trapped in one beyond the control of its mercurial and sometimes aloof owner is quite another. For the first few stories of Doctor Who’s first year the adventures of Ian, Barbara, Susan and the Doctor are as much about surviving their journey in the Ship itself, and of course in doing so, surviving each other. I’ve been saying for some time now that when this formula is applied correctly, classic Doctor Who can be astonishing, akin more to the theatre of its age presented in challenging locations, where the drama is as much caused by human conflict, madness, fear, paranoia, intolerance than its bizarre circus of humanoid aliens, who often work best as a reflection of the darker side of human nature: avarice (the Voord), intolerance (the Daleks), revenge (the Monoids). Sixties Who is humanist drama, and, bereft of Time Lords or a Doctor who sees the Universe of time and space as his plaything, it is an existential one as well. Like the best Science Fiction it speaks of the human condition, and like much of the media of its decade the Hartnell Era is informed by Britain post-war, it is by nature and to its credit a product of its time. If you want to see where Doctor Who began and where it could yet go, you should watch its beginnings. WE HAVE BEEN PERSUADED TO RETURN! Well of course we would. Who ever doubted it. In 2013? The Fiftieth Anniversary? To fall silent and wait for others to fill the void or do the hard work? 2013 is going to be a BIG ‘UN, even if the likelihood of this year’s TV input includes a mere eight episodes, a 60-minute ‘tentpole’ anniversary episode and a 90-minute Genesis of DW docu-drama. Even without a Christmas Special noted yet (which would be part of the 2014 programming block, surely?) there’s plenty going on and plenty to talk about. And we haven’t even mentioned further potential animations on the DVD schedule or the re-released BBC Books with new covers (including the novelisation of Remembrance? Well worth it, but… weird) We might even get a local fanzine out before year’s end – wouldn’t that be something? Us, stay away? Keep taking those crazy pills, missus. Good Lord, Gallybase. NINETEEN pages on (for Gog’s sake don’t Google him! )RogueCyberman (no I’m not Linking! I’m not Linking!) and his dodgy dodgy attempt to stir up interest and links to his adult pay site though a constant feed of claims in non-existent missing episodes? If you want to know the story it’s on the Past Doctors board, and it’s a litany of lies, being discussed and given undue longevity. Seriously, avoid. Shameful, exploitative and oily. The expansion of the DW Expanded Universe continues to expand like the Cybercontroller’s waistline! I dunno. eBooks based on peripheral (sorry, sorry – ‘core cast’) characters from the Who Universe like River Song and Paternoster? Not for me, sorry. I’m you’re your ‘THIS GUY is the main character, not the second-banana’ type, which is why I refuse to acknowledge Eccleston as a true Doctor (he’s more a locum.) Granted, I’m in a minority and this sort of thing is probably very popular and the kids love it, don’t they? THE KIDS LOVE IT, DON’T THEY? Annnnimation! The way of the future! Now that The Reign of Turn- er, Terror is out and The Ice Warriors teased through a ‘Coming Soon’ (tho no firm suggestion of animation at ‘time of writing), could it be the floodgates are finally opening? Oh but hey – Scott Gray’s new strip in DWM with its fun Kiwi inclusions again! A character with the surname Clutha? Lovely bit of Otago-ite namedropping there (look it up, northerners! ), and then there’s the (CAUTION: SPOILERS!) cute ‘NZ’ on a certain blackboard courtesy of (non-Antipodean) Martin Geraghty. 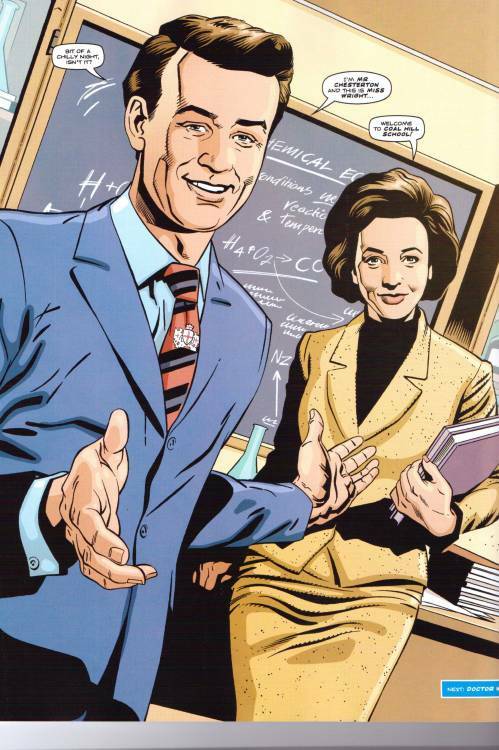 With this story being DWM’s ‘tentpole’ anniversary release of 2013, we wonder if there are more local cameos to come? MORE LOCAL CAMEOS TO COME? Sigh. That bastion of the Fourth Estate the Birmingham Mail reports that there’ll be a full-on multi-doc story for the anniversary oh yes there will. Oh yes there might, of course, but let’s not jump to the same conclusions reported here, folks. Worse still, don’t go believing the Daily Mail’s avowed hand-on-heart confusion between The light At The End (Big Finish’s ‘tentpole’ anniversary release of 2013) with whatever shows on the telly. Fact-checking and retractions are a twentieth-century media thing. This is what we invented the internet for, isn’t it? THIS IS WHAT WE INVENTED THE INTERNET FOR, ISN’T IT? Hey, you know what’s cool? The new title sequence and redone theme music. Oh and Star Wars coming back. Muse? I could pass, but hey.